Volunteer Ed Fry helps construct a community solar garden for low income customers of the Delta Montrose Electric Association. Fry is also a beneficiary from the project. For the poorest amongst us, paying every bill can be a struggle, including the power bill. Solar power hasn’t really been a go-to option for those at the bottom, but that’s starting to change. Colorado’s largest utility – Xcel energy – recently announced an expansion of a program to provide solar energy to low income residents. Its part of a proposed settlement agreement with the state’s public utility commission. There is a growing movement to finance solar power for the poor. The Obama administration has made it a priority through a new initiative called Clean Energy Savings For All Americans which will provide financing and training assistance to build these projects through a number of federal agencies. Colorado is already a leader in this. A first of its kind grant from the Colorado Energy Office in 2015 set aside $1.2 million to build solar projects for a half-dozen rural electric co-ops. These are community solar gardens, where users have a share of a large, centralized group of solar panels. Those users will exclusively be people with low incomes. Jeff Ackermann, the director of the Colorado Energy Office, said a lot has been learned about helping the poor save on heating costs, such as through weatherizing homes. “But, when you move to the electric side of the homes of low income folks it’s more challenging once you go beyond an efficient refrigerator or lighting,” he said. The idea is to build something that will lock in affordable long-term electricity for low income homeowners who often spend a much higher percentage of their income on energy than others. A solar non-profit called Grid Alternatives was hired through the Colorado grant to build the gardens. 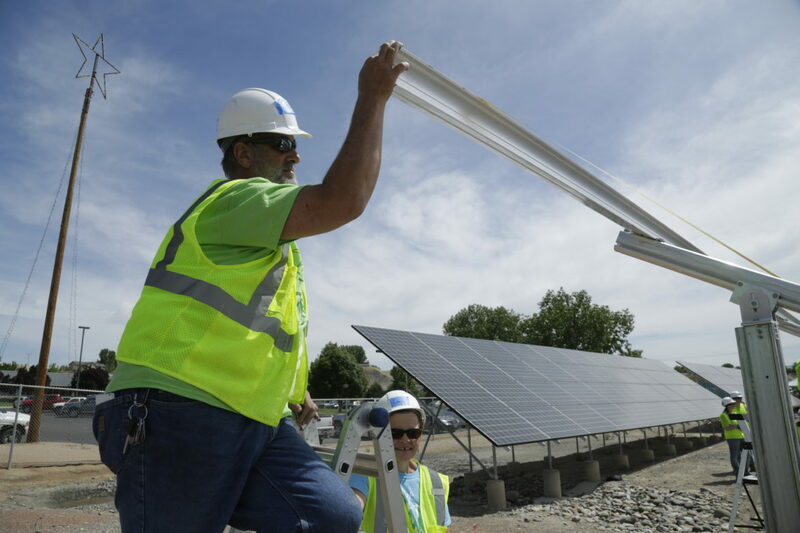 The executive director of the company’s Colorado chapter, Chuck Watkins, said the gardens at the Delta-Montrose Electric Association is the largest low-income solar garden in the country. The nearly 600 panels at the site will offset the power bills of some 45 eligible low-income households. “Our goal here is to try to reach a 50 percent savings on a family’s annual electric bill,” Watkins said. He added that for some families, the savings could be a lot greater. About 30 volunteers were helping put up the panels in Montrose. Some, wearing bright green shirts, are now the beneficiaries of the garden. That’s part of the deal cut by Grid Alternatives. Similar to Habitat for Humanity, the organization has beneficiaries volunteer to help with the construction of the gardens they’ll benefit from. “Every time I go by this now I can say hey, you know what, I was part of that project,” said one of these beneficiaries, Ed Fry. He’s is a retired firefighter and medic who lives on his social security check. The solar garden project should cut his electricity bill from $60 a month to about $20. “An extra $40 at the end of the month is a make or break on a fixed income,” he said. The state grant has also built these low-income solar gardens in Cortez, Nucla, Steamboat Springs, Gypsum, and Fort Collins. Three more are likely in the works. Check out our story and data analyzing low income energy bills. The Atlantic also covered this issue. Our series The Solar Challenge looks at how rooftop solar is creating problems for traditional utilities. Colorado’s largest utility just announced a settlement agreement on renewable power and billing that could usher in far more renewables in the state.